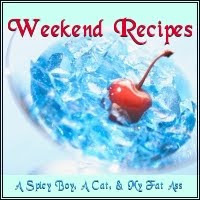 I'm feeling adventurous and decided to start a Weekend Recipes blog hop! I am someone who only cooks on the weekend, or on my days off... so it's a perfect idea for this type of thing. Add your blog name and the URL of your post to the MckLinky (Just click on button & it will bring you to original page). In small bowl, whisk together vinegar, pesto, oil and pepper; set aside. In large bowl, combine couscous with 3/4 cup (175 mL) boiling water; cover and let stand for 5 minutes. Fluff with fork; fold in chickpeas and green onion. Cut eggplant and zucchini lengthwise into 1/4-inch (5 mm) thick slices. Place eggplant, zucchini and yellow pepper on greased grill over medium-high heat; close lid and grill, turning once, until tender-crisp, about 10 minutes. Cut eggplant and zucchini into 1-inch (2.5 cm) wide strips. Cut pepper into 1-inch (2.5 cm) cubes. 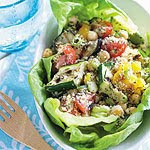 Add grilled vegetables and tomatoes to couscous. Add pesto mixture; toss to combine.